CNG: Printed Auction CNG 75. 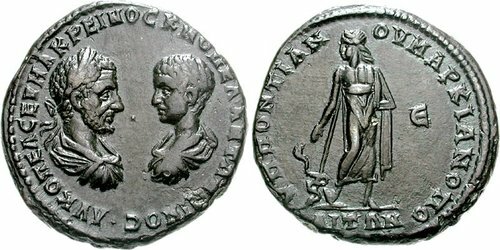 MOESIA INFERIOR, Marcianopolis. Macrinus. AD 217-218. Æ Pentassarion (15.53 g, 1h). Pontianus, legatus consularis. Sale: CNG 75, Lot: 783. Estimate $300. MOESIA INFERIOR, Marcianopolis. Macrinus. AD 217-218. Æ Pentassarion (15.53 g, 1h). Pontianus, legatus consularis. Laureate, draped, and cuirassed bust of Macrinus right, vis à vis bareheaded, draped, and cuirassed bust of Diadumenian left / Unbearded Asclepius standing facing, head left, leaning on serpent-staff; E in right field; VP PONTANOV in legend. AMNG I 745; Varbanov 896. Good VF, dark olive patina.